Do you ever just throw stuff together that sounds pretty good, based on something you have done in the past? Yea, me too and that is where this particular dish came from one evening. We needed to go to the grocery store but I wasn’t doing it that night. I had fresh peaches that were just about to go bad and a bag of frozen whole cranberries. So, I threw them together on the stove with a couple of other simple ingredients and this yummy thing came out. Honestly, I don’t know what to call this dish. When I do something similar with different flavors, I just call it cranberry sauce but that seems too confusing to just call it all the same thing. 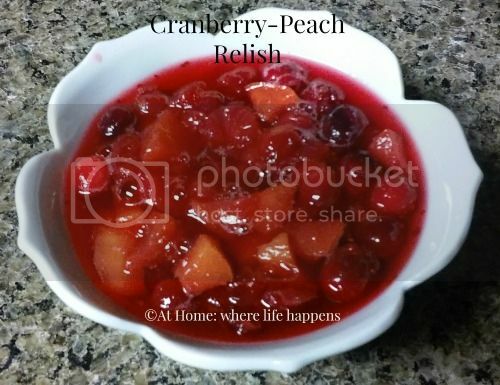 So, this is Cranberry-Peach Relish. It is super simple and I came up with it the other night when I needed something to go along with the easy dinner I was making. Something fresh and healthy. I had a bag of whole cranberries in the freezer (I buy several at Thanksgiving and Christmas so I have them all year long) and peaches that were to far gone to eat by themselves but just about right for cooking. I threw them together with a couple of other things and voila! A yummy, fresh fruit dish to go along with dinner. Turn heat to medium and cover – keep an eye on it because cranberries have a tendency to boil over once they start boiling! Serve warm or chilled. Both are great! 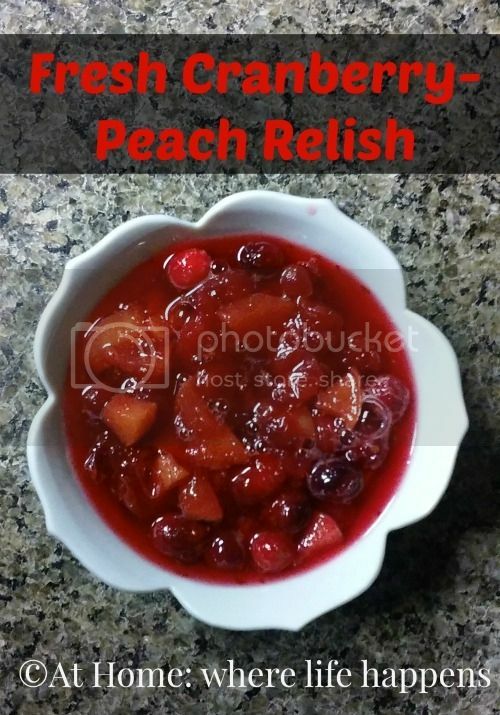 Enjoy this simple side dish of fresh fruit! 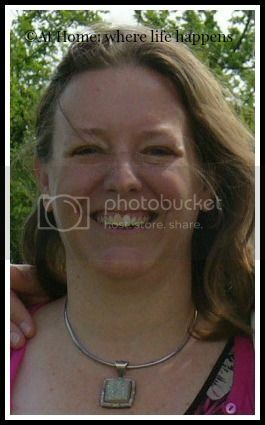 Lori blogs about life, homeschool, and whatever strikes her fancy. From schedules, to hymns, to crafts, to lesson, as well as lots of stuff about books, you can find her ramblings at At Home: where life happens.